We had such a great response to the Fifty Shades of Grey Screenplay Adaptation by Chad from @50ShadesCasting, we are going to keep posting new installments every day this week. 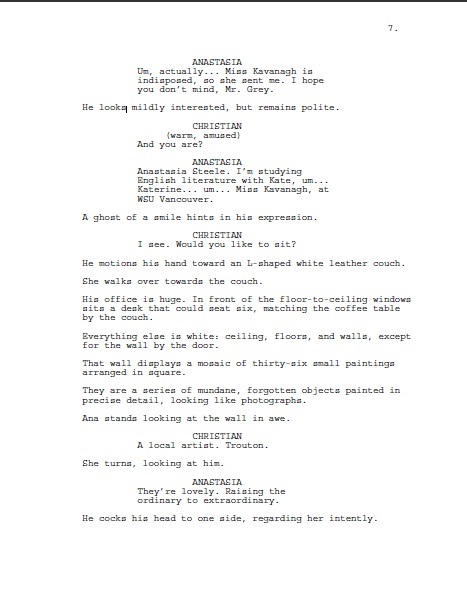 While this is not the actual screenplay, it is fun to read this version, created by Chad for our enjoyment. If you are enjoying this as much as we are, please let Chad know by sending him a tweet or leaving a comment below. We are up to the seventh page of the screenplay. Ana just fell into Christian's office and they are about to begin the interview. Follow us on Sulia, Twitter @FiftyShadesFilm and Facebook for update alerts on future installments and all Fifty Shades of Grey breaking news and information. E.L. James Takes Over Portland!